To view landscape paintings currently for sale at Philip Mould & Co, please go to www.philipmould.com. This charming picture is a rare example of the dog portraiture which began to emerge during the eighteenth century due to the increasing importance of dogs in English life. 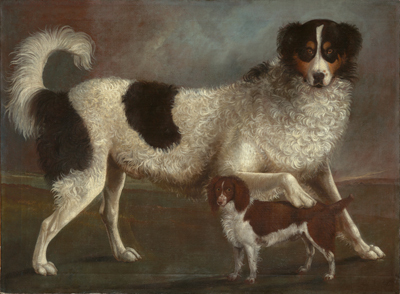 The emphasis on the dogs themselves, rather than their featuring as part of a scene, and their direct gaze at the viewer is unusual and serves to highlight the growing close relationship between man and dog in the eighteenth century. The larger dog in the present picture has been identified as a Newfoundland , a dog characterised by is large size, strength and gentle nature. The coastal landscape alludes to the dog’s function, but the dog itself is clearly the focus here, and he fills the large canvas, dominating the scene. The smaller dog depicted, a small or toy spaniel, serves to emphasize the size of the Newfoundland whose paw rests on the spaniel’s back in a gesture of dominance and authority. The Newfoundland hails from Canada but can be seen in British painting from the seventeenth century onwards. The Newfoundland’s popularity was at its climax in England towards the end of the eighteenth century and beginning of the nineteenth century which is reflected in the proliferation of paintings in which they feature. The artist Edwin Landseer much admired and painted the breed, which was eventually re-named after him. Whilst the dog is undoubtedly a Newfoundland, one must be aware that specific breeds were not clearly defined at this time which accounts for their varying appearance in paintings of the seventeenth and eighteenth centuries. It wasn’t until the formation of the Kennel Club in 1873 that breed standards were set for the first time. Dogs were usually described by their function; for example, a pointer ‘pointed’ at game for his master and a setter ‘set’ or froze on the spot allowing the guns to see and shoot their prey. The dog depicted here has historically been referred to as a spaniel which is not entirely incorrect as any dog with lopped ears could be referred to as a spaniel as a general description at this time. The types of dog kept in the 18th century can be divided into two groups – high-life dogs kept by the landed gentry and aristocracy, and low-life, or working dogs. The Newfoundland fits comfortably into both categories because although it was predominantly used as described above, it was also a breed kept by many wealthy families. A Landseer Newfoundland with very similar markings can be seen in Sir Peter Lely’s portrait of Henry Sidney, Earl of Romney c.1680-1685.